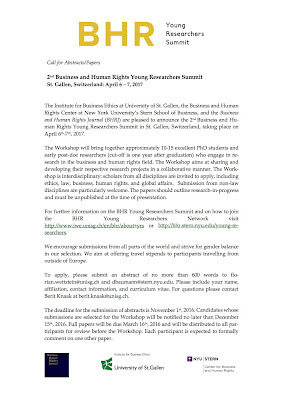 I am happy to pass along a call for Abstracts/Papers for the 2nd Business and Human Rights Young Researchers Summit to be held in St Gallen, Switzerland, 6-7 April 2017. It will be held in collaboration with University of St. Gallen's Institute for Business Ethics and NYU's Center for Business and Human Rights. Application deadline is November 1st, 2016. Please consider applying or otherwise may I encourage you to forward the call for abstracts (see below) to your PhD students and post-doc researchers and distribute widely among other interested researchers. The Institute for Business Ethics at University of St. Gallen, the Business and Human Rights Center at New York University’s Stern School of Business, and the Business and Human Rights Journal (BHRJ) are pleased to announce the 2nd Business and Human Rights Young Researchers Summit in St. Gallen, Switzerland, taking place on April 6th-7th, 2017. The Workshop will bring together approximately 10-15 excellent PhD students and early post-doc researchers (cut-off is one year after graduation) who engage in research in the business and human rights field. The Workshop aims at sharing and developing their respective research projects in a collaborative manner. The Workshop is interdisciplinary: scholars from all disciplines are invited to apply, including ethics, law, business, human rights, and global affairs. Submission from non-law disciplines are particularly welcome. The papers should outline research-in-progress and must be unpublished at the time of presentation. 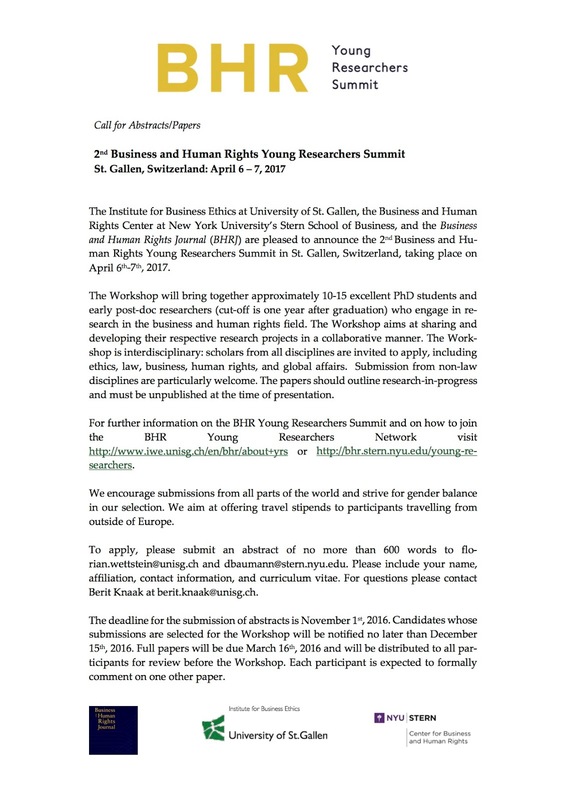 For further information on the BHR Young Researchers Summit and on how to join the BHR Young Researchers Network visit http://www.iwe.unisg.ch/en/bhr/about+yrs or http://bhr.stern.nyu.edu/young-researchers. To apply, please submit an abstract of no more than 600 words to florian.wettstein@unisg.ch anddbaumann@stern.nyu.edu. Please include your name, affiliation, contact information, and curriculum vitae. For questions please contact Berit Knaak at berit.knaak@unisg.ch. The deadline for the submission of abstracts is November 1st, 2016. Candidates whose submissions are selected for the Workshop will be notified no later than December 15th, 2016. Full papers will be due March 16th, 2016 and will be distributed to all participants for review before the Workshop. Each participant is expected to formally comment on one other paper.